While a pairing between RC Cola and MoonPies sound a bit out of the ordinary, the marriage has been happy and well since the 1930s. Coined as "The Working Man's Lunch" a meal of an RC Cola and a MoonPie would put you back a dime, making these two treats affordable to any coal miner or laborer. The two iconic American staples haven't always gone hand-in-hand. In fact, RC Cola was created almost fifteen years after the MoonPie. With their factories in Chattanooga, Tennessee and Columbus, Georgia their courtship was more of a long-distance affair. But before we get too far, let's get the whole story of their budding relationship. Back in 1902 the Chattanooga Bakery in Chattanooga, Tennessee was at the peak of production. Selling over 150 different products like Vanilla Wafers and Graham Crackers, the bakery was thriving. It wasn't until a few years later Mr. Earl Mitchell, Sr., a bakery salesman picked up the idea to make MoonPies from a store that coal miners frequented. Asking a Kentucky coal miner, Mitchell wondered what kind of snack he would like to eat. He replied, thinking about a quick snack to grab while holding up his hands to show he wanted the snack to be "as big as the moon". Once back in the factory, the bakery decided to get to work creating a new snack. The factory workers would sometimes dip the graham crackers into marshmallow and Mitchell jumped in with an idea of sandwiching the marshmallow between two graham crackers and covering it with a chocolate coating. The original MoonPie became an instant hit. New varieties of the treat started popping up like the mini MoonPie, the double-decker MoonPie, and even a chocolate MoonPie made with chocolate flavored marshmallow. Whichever flavor people preferred, the American south wasn't the only place where people fell madly in love with MoonPies. Japan, where moons are considered sacred, fell in love with the chocolate treat. And the love doesn't stop there. There are numerous festivals across the South that celebrate MoonPies and host MoonPie eating contests, however, the most popular celebration that uses MoonPies is none other than Mardi Gras. The tradition started at a Mardi Gras parade in Mobile, Alabama when parade-throwers decided to throw out something other than beads into the crowd. Smaller than the Cracker Jack boxes (which were banned due to hurting parade-goers) the mini MoonPie became the standard treat thrown at the Mardi Gras parade in both Mobile and New Orleans. 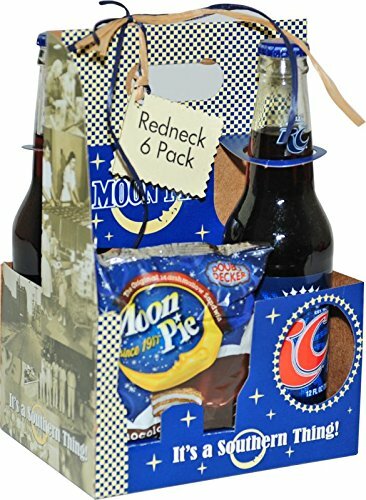 With all this talk about MoonPies, I almost forgot about the other half-RC Cola! Born in Columbus, Georgia, RC Cola was created due to differences with Coca-Cola. Claud Hatcher, a pharmacist, and grocer, asked their local Coca-Cola salesman if he could get a discount since he buys so much of the drink. Coca-Cola said no, and with that, Hatcher vowed to never buy the stuff again. He spent months coming up with the perfect soda formula and finally landed on Royal Crown Ginger Ale. Becoming popular, the family shut down the grocery store and focused on the soda brand (which ran under the name Nehi after Coca-Cola sued), inventing sodas like Nehi and Chero-Cola. Then the Great Depression came. Like many businesses, the financial turmoil caused a drop in sales and to make matters worse, Claud Hatcher died, leaving the company in the hands of sales director, H.R. Mott. Once Mott took over the formula for the cola was changed as well as the name. RC Cola was no longer an infringement on Coca-Cola and the product began to sell all across the South, mainly paired with MoonPies as a Great Depression snack. From there on, Royal Crown Cola and MoonPies became the cultural icons for the working-class. Neither of the two brands had ever decided to pair the two products together but rather it was the work of the Southern culture. So turn on this Bill Lister country tune, unwrap your MoonPie and pop open your bottle of RC Cola- It's time to indulge on this Southern classic.